Even before the game starts you have to get to a park. Ah, yes, the mid eighties – when shin-high trainers and wild, unkempt mullets were all the rage for wannabe sporty-types. Fads and crazes came and went almost on a weekly basis (thankfully, the mullet went and never came back), one of which stayed the course longer than most was the trendy art of skateboarding. Slowly, it began to take over the world – particularly in the demographic of boys between ten and sixteen. Atari (never ones to miss a trick), thrust 720° (that’s two mid-air 360° turns, fact fans) into arcades when using those tiny four wheels was at the very peak of its popularity. The game was rather eye-opening at the time, delusions of hammering around the local area like Marty McFly in Back to the Future were set to become a reality, and all for 20p at the local Magic City. I played it until my gaming knees were red raw, and continued the love affair when it was faithfully converted to home systems a year later. 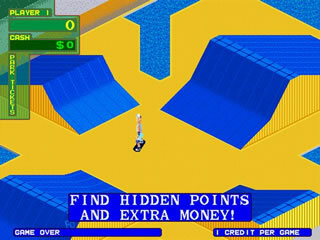 The general premise was to take your little skater around the local neighbourhood performing jumps and tricks along the way, and eventually rolling up at specific events such as slalom racing, downhill time trials and some classic half-pipe shenanigans (which California Games would jump on board with soon after). Completing these tasks resulted in medals and cash, and you able to upgrade your gear and work on through the now worryingly-repetitive storyline. In a bid to mix things up a bit, a timer would count down as you free-wheeled around the map. When it was time up, a pack of killer hornets arrived and chased you around, as the call of “Skate or Die!” went up on screen. They didn’t mince their words back in the day, did they? It was only then, when you had to find a skate park before getting your rear-end pierced, that the adrenalin really started pumping. Going with the diagonal viewpoint (à la Paperboy), 720° looked pretty smart and was a smooth mover indeed. 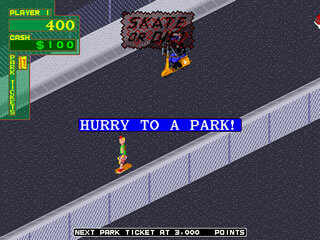 The arcade version was a cool mass of machinery as well – speakers sat above you in a boom-box type arrangement whilst a smooth circular joystick was used to move your skating fella around which was state-of-the-art at the time. The home conversions were also well received, and upon playing its rebirth on the Midway Arcade Treasures compilations for PS2 a couple of years ago, I found myself (a) picking up where I left off 20 years ago, and (b) pressing ‘Mute’ on the remote within seconds as memories of the soundtrack making my ears bleed came flooding back. I was also amused by your skater’s fondness for his turquoise ensemble, including cap (and what a cap! The front ‘bill’ part has some severe bending going on – very impressive).